Exponentially growing network traffic is triggered by different services including cloud computing, Content Delivery Networks and other. To satisfy these needs, new network technologies like Elastic Optical Networks (EON) are proposed. The EONs bring new, hard optimization problems, like Routing and Spectrum Allocation problem considered in this paper. The well-known and common tools to solve the NP-hard problems are Evolutionary Algorithms (EA). A number of EA-based methods were proposed to solve the RSA problem. However, the papers concerning the RSA problem omit the relatively new propositions of linkage learning methods. 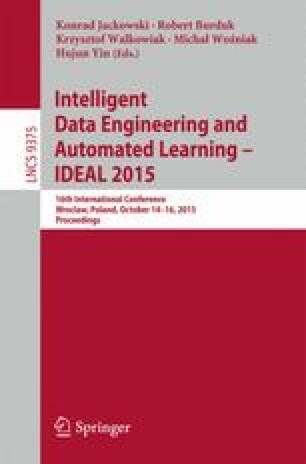 Therefore this paper proposes a new effective method that includes linkage learning, local optimization and is based on a novel, effective work schema to fill this gap. The author of this work would like to express his sincere appreciation to his advisor professor Krzysztof Walkowiak for his valuable suggestions during the paper redaction process. This work was supported in by the Polish National Science Centre (NCN) under Grant DEC-2012/07/B/ST7/01215 and by the European Commission under the 7th Framework Programme, Coordination and Support Action, Grant Agreement Number 316097, ENGINE – European research centre of Network intelliGence for INnovation Enhancement.